Can Gympies own Aidan Raymont defend his Queensland Championship Title when the Budget Steel Queensland State Modified Sedan Title hits the track at Corbets Group Mothar Mountain Speedway on Saturday 20th and Sunday 21st April? Aidan has already had a most successful season and now, along with many others, faces the prospect of two major title events on back to back weekends. Firstly to defend his state title at Gympies Corbets Group Mothar Mountain Speedway and then the national title at I.B.R.P Kingaroy Speedway the following weekend. Aidan is a master on Corbets Group Mothar Mountain Speedway, but, the list of opponents is quite remarkable. One time National Champion, Brett Baxter is also a local Mountain competitor and knows and loves that Title winning feeling. The big unknown in the field is certainly Chris Pagel who has won the Queensland State Production sedan Title and has decided to take on the Modified section for this title. He has already had a practice run in the Modified Sedan class coming home a very creditable second in a class field on his home Mountain track. 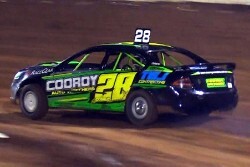 Rory Evans and Aaron Sander are two other high profile Production sedan drivers having a go at a Modified Sedan Title. Watch them closely. Allan Mortimer has travelled from WA for the title. Jake Drewett, Matt Nelson and Kye Walters, who has had success on the Mountain, have all travelled from Victoria for the title. Drivers have also come from all over Queensland for the title. It will, no doubt, be a memorable occasion. As usual, only one more thing to say BE THERE!